EL SEGUNDO, Calif. (KABC) -- Nearly 400,000 people in the United States suffer cardiac arrest every year, and less than a third get CPR or cardiopulmonary resuscitation. It's a troubling statistic given some who say that if you do simple CPR on a person post heart attack, you can double or triple their chance of survival. However, there's an easy way to become a potential lifesaver; learn how to give hands only CPR. ABC7 has partnered with UCLA Health and The American Heart Association for this year's CPR Palooza. You can register now for one of the massive, free CPR training sessions, being held at the UCLA Health Training Center. Sessions are 45 minutes long, and there are 2 sessions offered. Everyone over the age of 10 is welcome! Even if you've already learned CPR, it's good to refresh your skills so you're ready if needed to perform bystander CPR. But, you need to register first! 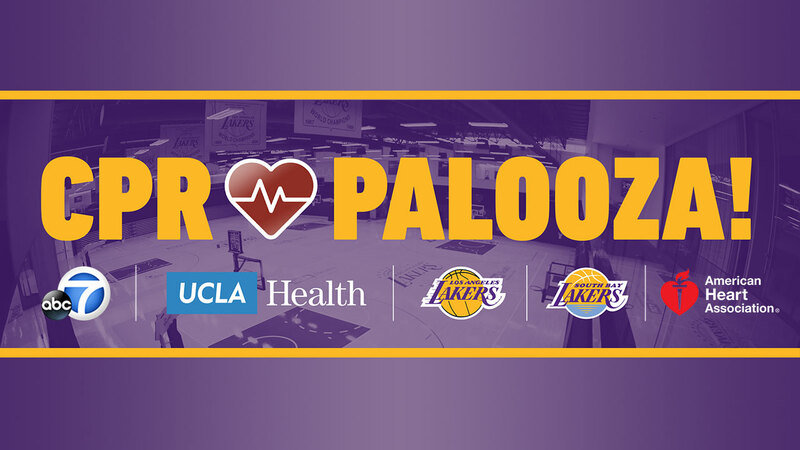 Go to https://www.uclahealth.org/lakers/cpr-palooza to sign up. Besides learning CPR, participants at CPR Palooza will also get free blood pressure screenings, and t-shirts, plus other fun giveaways!